The first set of headphones I owned came with a Walkman cassette player. They were flimsy with uncomfortable foam pads that covered my ears, a wire that was prone to making the sound crackle, and a thin metal band that went over my head and was bent in twenty places by the time I was done. The sound quality? Well, there was sound, so technically they functioned. The House of Marley audio products are infinitely superior to those old headphones, and even to the ones I’ve been using today. The House of Marley makes earbuds, headphones, and audio systems all inspired by Bob Marley. How do they do that? 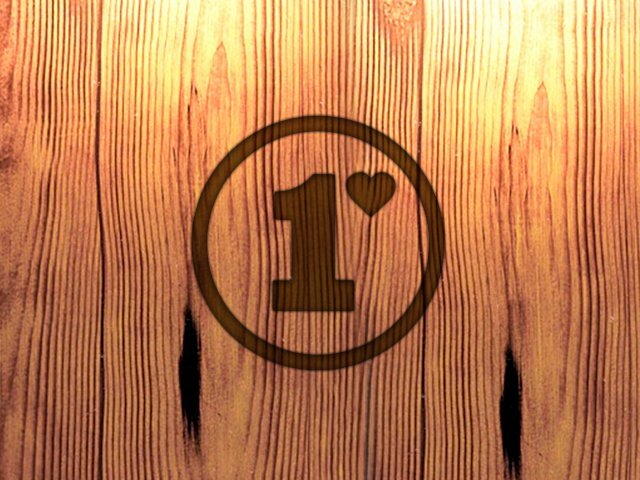 By focusing on delivering high quality products through an environmentally friendly and cause-minded company. Using reggae as the benchmark for their audio testing, they strive for a rich bass sound that won’t distort or lose integrity at higher volumes. Their aim is to balance that rich bass so the highs aren’t drowned out and every voice and instrument is clear and discernible. 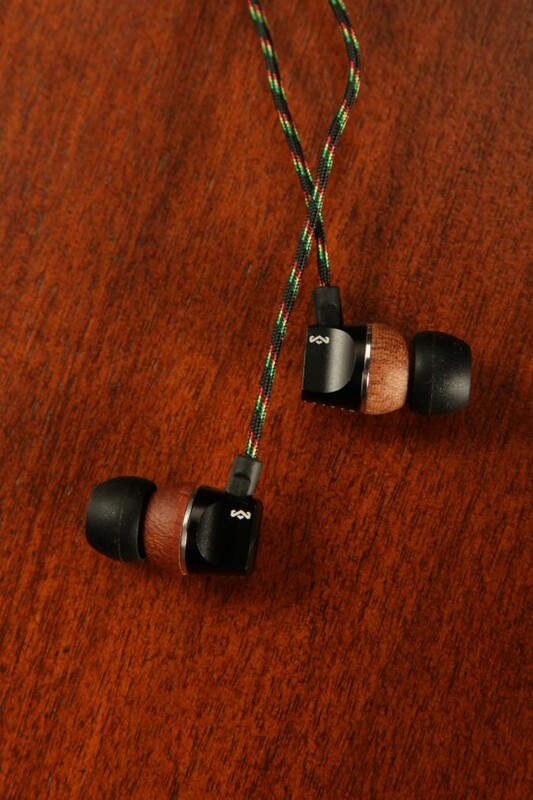 In addition to sound quality, products are produced in a way that is as earth friendly as possible with renewable materials in the products and packaging, like FSC-certified woods, organic cotton, and recyclable aluminum. You can see just opening the boxes that there is very little plastic packaging. Instead you have recycled cardboard inserts and strings that simply need to be untied to release the products. The company also gives back to the community through 1love.org, the Marley Family charitable organization. It’s mission is to both make contributions to organizations that help empower people and to also encourage every one of us to help out in our own way, locally and globally, to improve the quality of life for everyone. If the kind of company you do business with is as important as the product they sell, then this is a company that will make you happy. I had the opportunity to check out two products from House of Marley, the Zion Earbuds ($99.99) and Stir It Up Over-Ear Headphones ($199.99). Yes, neither of these are cheap, but they both deliver on their price points. The earbuds come with a handy little carrying pouch and five different ear tips so you can choose what you find most comfortable. Once I had the perfect tips, they held in place easily even while I was huffing away on a treadmill and my ears didn’t feel sore after wearing them for a good hour. I found the sound quality to be higher than what I’ve experienced on other similarly priced earbuds. The bass was, as promised, very rich, but none of the higher notes were lost in the process. They nicely blocked out background noise, too, so I heard the music, not everyone else in the room. I also liked the look of the wood and recycled aluminum exterior and the green, gold, and red fabric cord which, at 52″, was long enough that I didn’t accidentally pull the earbuds out, nor did I find it getting tangled on everything. Both the earbuds and headphones feature a three-button volume and mic control that makes it easy to flip between songs and phone calls if you’re using them with your phone. I found the call quality good, and my callers reported that when the mic was just resting where it fell a few inches away from my mouth that it sounded like any speaker phone, but that when I picked it up and held it closer they actually couldn’t tell it was a mic at all. The headphones also come with a canvas carrying case and, as expected, offer an even better sound experience than the earbuds. The bass sound is incredibly rich creating the kind of sound that you don’t just hear, but actually feel. 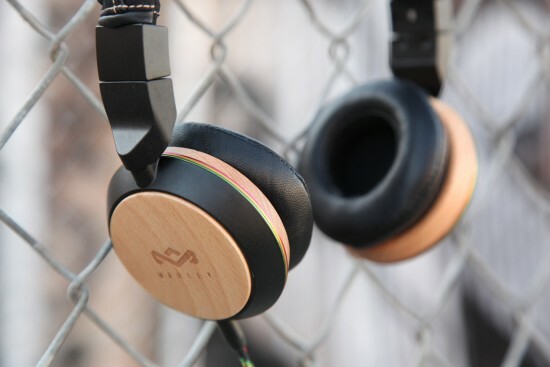 The House of Marley’s focus on bass is really evident in these headphones. Still, there is no sacrifice in the rest of the sound quality, with all the highs coming through crisp and clear. These have natural wood and aluminum accents, just like the earbuds, with the addition of a narrow green, gold and red stripe around each earpiece that gives it just a hint of color. The fabric covered headband is lightweight and adjustable, but it’s not particularly large so it might be a snug fit on a larger person. Aside from that, they were comfortable, easy to wear, and did a great job of blocking out background noises. If you’re in the market for earbuds or headphones, it’s definitely worth checking out the Zion Earbuds and Stir It Up Over-Ear Headphones which are sure to provide you with a quality audio experience. I was provided with these items for review.